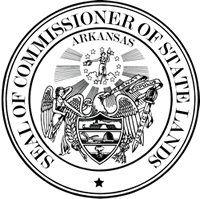 The Commissioner of State Lands Office was officially created by Act 20 of 1868, namely, "An Act to Provide for the Appointment of a Commissioner of State Lands and Immigration" and became an elected office with the passage of Amendment 37 of the Arkansas Constitution in 1874. Currently, it is one of only five elected Land Commissioners in the United States along with Washington, South Dakota, Texas & New Mexico. As most Arkansans are aware, its primary responsibility today is the collection of delinquent taxes on real estate. If not collected at the county level, the parcels are certified to the State Land Commissioner for public auction. Since 2003, the Commissioner of State Lands has collected over $123,000,000 for public schools. The Land Commissioners Office also has jurisdiction of mineral leasing on state owned property foremost being the states navigable streams and river beds for the extraction of sand and gravel. Perhaps the least known duty is the housing of the state's original land records. In the early days of the Arkansas Territory, the Land Office was actually a part of the State Auditor’s Office. Known as the General Land Office, its duties were to administer the Federal Government’s programs moving public land into private ownership and record the transactions. Not surprisingly, many of the state’s first General Land Surveyors would later serve as the State Auditor. With the passage of Act 20, the new Land Commissioner's Office was to, "…take possession and have charge of all of the books, papers, evidences of titles, plats and maps…" Eventually, as all of the public land was donated, homesteaded or bought, the Land Office evolved more into the tax collection agency that it is today. As Commissioners changed and decades passed, the original land records were essentially forgotten and sat in obscurity in the basement of the State Capitol. Some were lost, donated (Arkansas History Commission and Universities) destroyed, water damaged, and others simply disappeared. Like the saying, "We knew we had them, but we didn’t know what we had..." in 2009, the Land Commissioner’s Office began piecing these records back together. Although some are missing, records long thought to not exist were found. Many volumes have not been viewed by the public in well over one hundred years or longer. These records represent not only Arkansas history, but also where land title began. Arkansas Territory officially recognized (July 4, 1819). Until this date, Arkansas still considered Missouri Territory. Ordinance of May 1861 (Arkansas Secedes from the Union) Deed numbers of Swamplands & Internal Improvement Lands start over at #1. Swampland deed numbers also start over at #1 again in September 1865, following the Civil War. Arkansas Commissioner of State Lands Office officially created (1868). Some deed numbers start over at #1.